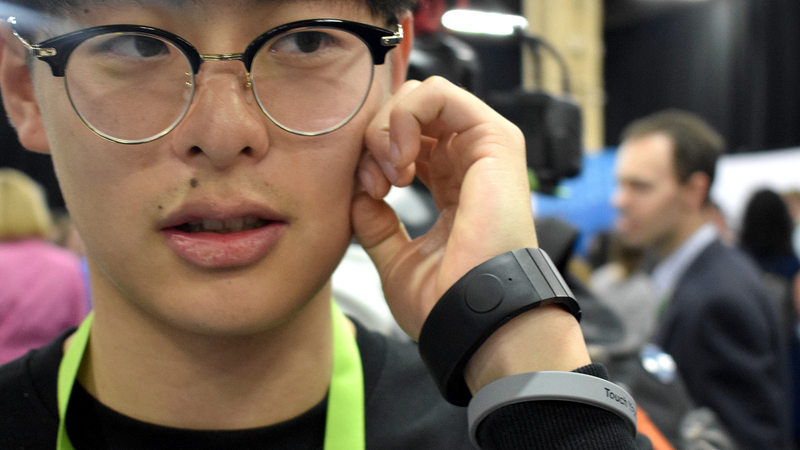 At last year's CES we got our finger on Sgnl, a smart strap born from Samsung's C-Lab that lets you take calls with your fingertip. It's a hearable, but not one you actually put in your ears. Sgnl uses bone conduction technology to transmit sound from the band around your wrist, up through your hand and finger, into your ear. It's pretty cool, and at the team have confirmed the strap will ship in March, first to Kickstarter backers and then followed by a wider launch. Since last year, they've been tweaking the sound performance to make it sharper and block out more of the outside buzz. It sounded good in our short demo, but we didn't get to take a call on it - that will be the real test. Phone calls are its primary purpose, but you'll also be able to hear notifications or use it to watch a video. You probably won't use it for listening to music, unless you want to draw a lot of strange glances as you go about your day with a finger lodged in your ear. There's a microphone inside the band so you'll be able to talk back to the person you're on a call with, or speak to your personal assistant. Speaking of the band, it's actually a smart watch strap that will be able to fit any watches that support 22mm bands. But if you'd rather just wear it as a band, you can, it'll just look like a generic fitness tracker. The band will cost $249 when it launches in March. Battery life can run for a maximum of four days, but just under four hours of active use. Fear not, we'll be bringing you a full review before long. This product is a joke. Sgnl took over two years on this. its been 27 months and they still have n ot shipped out a product for those of us who paid. they said it would be here over two years ago. they refuse to refund anyone who demands it, and every single backer who DID get it, says its a garbage product. they basically slapped a small bluetooth speaker into a rubber strip and called in a body conduction unit. its total junk. Theft and fraud with this company. AVOID SGNL. head over to the kickstarter or indigogo pages and look at the comments. youll see what junk they are peddling and how horrid their customer service is. ignoring everyone who still hasnt gotten it or sending dead products etc.